The story is told in two parts. The first part is called ‘Before’ and contains the First Person narrative of John Wilkins as he makes a statement to Doctor Max Andreadis, consulting psychiatrist. In this statement, John talks about his life and how he came to marry his wife, May, although he starts with the event that changed his life and landed him in the unfortunate position that he is now in. ‘It all began one day in April when I went round to change a library book.’ It was there that John met Sheila and became obsessed with her. John is the perfect example of an unreliable narrator. He is an insecure and immature young man, convinced that his boss is treating him unfairly and, despite his marriage, he is still coddled by his doting and extremely bossy widowed mother. John is the ultimate victim, always blaming others for his own shortcomings. Throughout his narrative, John paints a cruel picture of May, with the result that the reader, seeing her through the mirror of his dislike, is forced to wonder whether she is really as unattractive as John claims. This leads the reader to query all the relationships and events that John reports. The second part of the novel, ‘After,’ is a Third Person report of John Wilkins trial for murder. It is a sardonic look at the British legal system in the 1950s and the effect on the people involved before, during and after the trial. At the end of the book the question still remains, of whether justice was really done and if the truth was revealed. The Colour of Murder was originally published in 1957 and has just been republished by the British Library with an excellent introduction by Martin Edwards. It was a ground-breaking book when first published and is still an intriguing and skilfully structured book, which gives an insight into the social customs of ordinary people sixty years ago and queries about a legal system that persist up to this time. A clever book that is well worth reading. 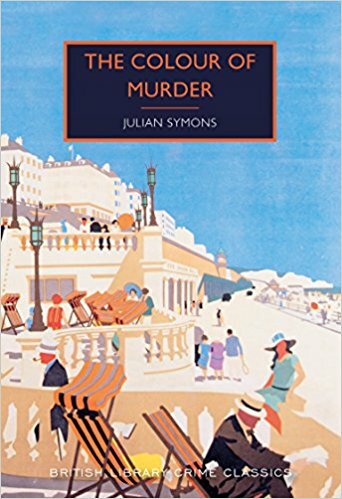 Julian Symons (1912-1984) was a notable writer of British crime fiction from the 1950s until his death, publishing more than thirty novels in total. He served as President of the prestigious Detection Club, won two Edgar Awards from the Mystery Writers of America, and is well known as the author of Bloody Murder, a classic history of crime fiction.